It might seem like I’m describing myself, but I’m really describing this fabulous one-pot Mediterranean pasta with hearty chunks of wholesome mackerel—and I can’t get enough of it. For the past few weeks I’ve been all about quick and easy. As my work load piles up (along with my laundry), I’m realizing more and more that time is precious and so are sheet pan meals and Instant Pot dinners. Lately, I’ve found myself reaching the point where I’ve been forgetting to eat lunch some days, or at least until I’m hit with a dizzy spell mid afternoon. Not cool. My life clearly needs more purse snacks and breezy meals. And if that breezy meal can be an exquisite pasta, even better. One-Pot Mediterranean Pasta With Mackerel. I’m both thrilled and relieved to be adding this dish to my collection of straight sailing meals. Besides being a cinch to make, it’s so sososo good—for your tastebuds and your heart! Just imagine twirling your pasta into a medley of burst tomatoes, roasted red peppers, tangy red onion, briny capers, garlicky olives, and meaty good-for-you mackerel. You’ve probably had tuna in pasta before, but mackerel kicks things up a few glorious notches and once you try King Oscar’s, you’ll never look back. In this one-pot recipe, I’ve used fresh pasta. One-pot recipes that use regular dried pasta are great and all, but the pasta can take a long time to cook and there’s a lot more tending to the pasta so it doesn’t stick together and all that jazz. With fresh, I’ve found it to be a much quicker process. You’re still going to tend to your pasta to prevent sticking, but for a measly 5-7 minutes as opposed to 20. If you do want to use dried pasta, prepare it separately on the side and simply add it to the pan of veggies at the end, tossing to coat. There’s canned fish, and then there’s King Oscar’s canned fish which, in my mind, is a few steps ahead of all other canned fish. Call me a canned fish elitist, I don’t care. Secondly, it’s a healthy choice. Mackerel is super low in mercury and contains loads of Omega-3 fatty acids which are great for your ticker. They lower blood pressure, reduce triglycerides, and slow the development of plaque in your arteries thus reducing your risk of heart attack and stroke. Last but not least, it’s sustainable. KO’s mackerel is fished from the Northeast Atlantic ocean between Norway and the Faroe Islands using a midwater trawl—so the seafloor and its habitats aren’t disturbed. In short: fill up and feel good. This One-Pot Mediterranean Pasta With Mackerel is a heart-healthy dinner that brings you big flavor and a generous amount of Omega-3 fatty acids—and it's ready in 20 minutes! Heat the oil in a large pan over moderate heat. Add the garlic and onions, and let them simmer for about 2 minutes or until the onions are translucent and aromatic; stir if needed to prevent the garlic from burning. Add the tomatoes, olives, artichoke hearts, capers, and roasted red pepper. Bring the heat the medium-low, cover, and let simmer for about 5-7 minutes, stirring occasionally, until most of the tomatoes shrivel and/or burst. Once most of the tomatoes have burst, add the contents of the can of mackerel to the pan and, with a big spoon or spatula, break the mackerel down into chunks or flakes. Add the water to the pan, followed by the fresh pasta. Stir the pasta into the liquid so it's covered and let it simmer for about 5-7 minutes, or until the pasta is cooked to your preference and the water is absorbed. Finally, add the marinara and toss to coat. *I didn't use salt in this recipe since the capers and kalamata olives bring a good dose of saltiness to the dish. If you do need more for some reason, add a pinch of kosher or sea salt to the tomatoes and veggies while they cook down, and stir. ** If you're not using fresh pasta, simply cook you dry pasta on the side separately. Once your tomatoes are burst, when you'd add the fresh pasta, you can toss in the already cooked pasta, omit the water, and add the marinara. What a gorgeous recipe and photos, Dana! 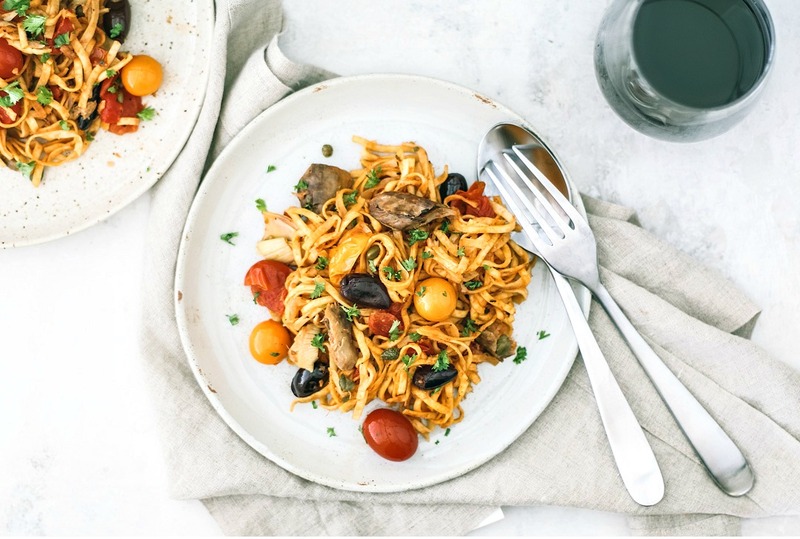 I love a good late-summer pasta dish and the combination of the cherry tomatoes, capers, olives, and artichoke hearts with the mackerel sounds divine. (There are few things I love more with pasta than burst tomatoes!) I have a can of the King Oscar Mediterranean Mackerel in my pantry and this sounds like the perfect dinner to make with them. This is going to be on my plate soon! It excites me GREATLY that you've got a can of this good stuff already kickin' around in your pantry. I honestly can't get enough of their mackerel. Last week I had their plain mackerel for lunch every day in a bowl with quinoa, avocado, cucumbers, and a drizzle of soy sauce. Their products are so tender and are amazing alone or incorporated into recipes. I hope you love this when you make it! The recipe looks wonderful and I love one-pot meals. Now, I haven't had much experience with canned mackerel. I won't go into detail about my last experience -- I've got to find your brand. Are there special stores where you get it? We do love seafood so I would think that we'd like this. Uh oh — I'm sorry you had a bad experience! I can promise you won't have a negative experience with any KO products. Definitely keep an eye out for them. I have never cooked with mackrel, but my husband likes it. This is the perfect recipe to introduce it to myself. One pot simple meals are what I am all about right now. This is truly a beautiful bowl of pasta! I think we all need more breezy one pot meals in our lives! And more good food. Life is too short to eat substandard canned fish (or anything else!) so I'm with you on being a canned fish elitist. I really love your combination here of the canned mackerel with the burst tomatoes and all those great veggies. That is a pasta meal which will fill you up and leave you feeling good. C'mon Dana, let's not kid ourselves. You were describing the dinner and yourself. It's ok to admit it. I quite like mackerel but I know that the stronger flavour can be a challenge for some. Pasta is a great way too go (nice starchy way spread the flavour out) and the bright acidity of the tomato makes an excellent foil to the richer, brinier fish. And as for being a canned fish elitist - well that's a good thing in my mind. Canned fish can be absolutely fantastic, and it's held high status in parts of Europe (especially Spain) for a long time and for good reason. Like anything else in the world of food, it's all about quality - and it's nice to see recipes like this bringing that quality to the forefront! Girl, I saw this on Instagram and you had me DROOLING. This one pot pasta is right up my alley and I need it in my life right now. I didn't know the benefits of eating mackerel so I'm excited to introduce it to my diet now! Lemme at those omega 3s! Ah hahah when I read your first three lines, Salty, Spicy, Laid back my instant thought was "Sounds like me!" Ha. And girl you DEF need to get some purse snacks!! It took me having kids and being preggo to truly appreciate the purse snack! I hear you with the schedule and everything needing to be quick and easy these days - pinning this to my weeknight dinner board!!! Love the clean up with just one pot. These are my favorite flavors too. Those photos are making my mouth water. This will go high up on the meal planning list. Wowza! That is SOME PASTA DISH! Mediterranean flavors are always welcome in our house, and that canned mackerel makes this more of a pantry staple dinner than one I'd have to make a special trip to the store for. Love the convenience and the bold, vibrant flavors. What time is dinner? I'll bring the wine. Love the ease of this one pot dinner. We love all kinds of pasta. This would be perfect with a glass of white wine, sitting on the deck enjoying the late summer evening. What an interesting combination of flavours happening here too. Oooh...I'm liking the flavors in this pasta! And the Mackerel is a great addition. This looks sooo good! I love one-pot meals, and pasta, and mackerel - so combining all of them with some tomatoes on top is perfect! This looks so fresh and worth a huge plateful. Love the Kalamata and other distinct flavors in there. oh wow this looks stunning! your photography is gorgeous and I love that white bowl! the recipe look fab too, I'm always a sucker for any kind of pasta! Mackerel is such an interesting thing to add. I think it makes the perfect addition with the creaminess of the noodles and the acidity from the tomatoes. I really want to try this!